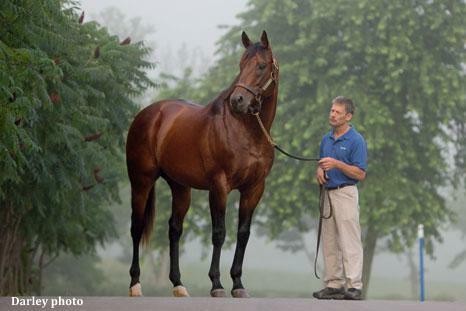 Pensioned from stud duties in June of 2017, champion sire and world record-breaker Elusive Quality has succumbed to the infirmities of old age and has been euthanized. Elusive Quality was trained by Bill Mott and raced in the colors of Sheikh Mohammed before retiring to Gainsborough Farm in Versailles, Kentucky in 1999. Gainsborough was then owned by Sheikh Mohammed's eldest brother, Sheikh Maktoum, but upon his passing in 2006, Elusive Quality was relocated to Jonabell along with Quiet American. Elusive Quality won at the first time of asking, breaking his maiden impressively at Belmont Park in May of 1993 by 11 1/2 lengths. Although he didn't win a G1 during his racing career, the son of Gone West put up several impressive high-level performances. As a 4-year-old, he broke the track record at Gulfstream Park, going seven panels in 1:20, and then, on just his second career start on the turf, he broke the world record for a mile in the G3 Poker Handicap on the grass, stopping the clock in 1:31.63 seconds. He won seven other races, including a victory in the G3 Jaipur Stakes, and was also stakes-placed in the G2 King's Bishop Stakes and the G2 Tom Fool Handicap. When he retired, his stud fee was set at just $10,000, but it didn't remain at that level very long given the tremendous early success he achieved. His very first crop produced 11 Black Type winners, including French G1 winner and champion Elusive City. Foals from his second crop included the aforementioned G1 Kentucky Derby winner, G1 Preakness winner and Eclipse Award winner Smarty Jones, plus G1 Breeders' Cup Filly & Mare Sprint winner and Eclipse champion Maryfield. By 2007, his fee had reached $100,000. His other top northern hemisphere performers include European Darley stallion Raven's Pass, British champion miler and winner of the Breeders' Cup Classic in 2008; Quality Road, four-time G1 winner and successful young sire whose Abel Tasman captured last year's G1 Kentucky Oaks; plus champions Elusive Kate and Certify. He shuttled to Australia from 2003-08 and was represented by multiple champion and now successful young Darley sire Sepoy, plus G1 winner Camarilla. From 2009-11, he travelled to Brazil where he sired Champions Sai De Baixo and Ana Luisa along with G1 winners Colorado Girl, Avenger Of Light, Last Kiss, Bonaparte and Birkin Bag. Elusive Quality has sired a total of 242 worldwide Stakes horses to date, 130 Black Type winners and 52 Graded or Group winners, 14 of whom have been victorious at G1 level. As a broodmare sire, he is represented by 73 Black Type winners – 29 in Group or Graded company – with six winning at the highest level, including 2017 Breeders' Cup Sprint winner Roy H, Alcibiades winner Gomo, and Darley Prix Morny winner No Nay Never. This entry was posted in Bloodstock, NL Article and tagged bill mott, Dan Pride, darley, elusive quality, Gainsborough, sheikh mohammed by Press Release. Bookmark the permalink.